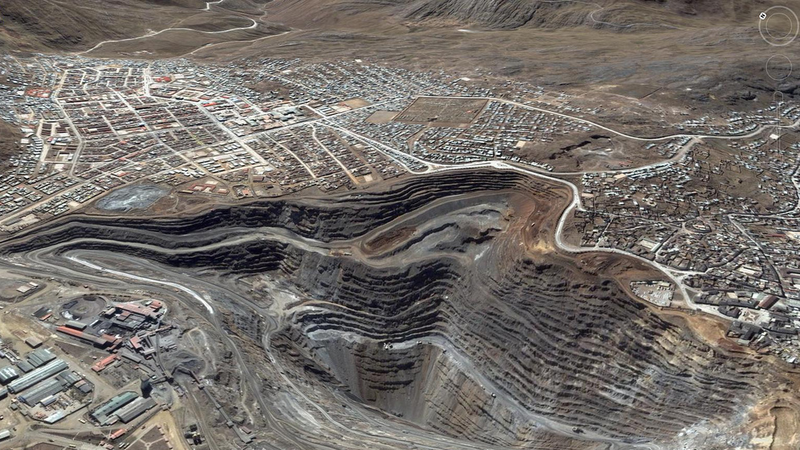 Zinc-lead-silver mine in the middle of the city of Cerro de Pasco, Peru. Photo: SkyTruth. CC BY-NC-SA 2.0 (cropped). The promise of sustainable development is not intended for only some people, nor is it supposed to require more sacrifice on the part of the poor and dispossessed. As the world economy becomes increasingly connected and unstable, the costs of industrial development also become ever more obvious as social conflicts and environmental damage worsen. Yet governments and investors seem even more committed to going faster down the same track that has led to these problems. Mining, in particular, keeps pushing the boundaries. Massive open-pit mines keep getting bigger and consuming more water and land, displacing increasing numbers of indigenous people and peasant farmers who have nowhere else to go. Ore grades are falling as all the best deposits are mined out, and we are on track to actually run out of many metals over the coming decades — even if we mine the most remote and delicate areas of the planet. Clearly, raw material consumption has to be reined in. It would really help if we used these materials more efficiently, and did not allow them to be dumped in landfills or developing countries. But in our market-driven economy this will only happen if metal prices reflect their true social and ecological costs, making it more worthwhile to reuse and recycle, or do without. The key to this may surprise you — it lies in the affected communities themselves. Tough laws, regulations, standards, and international conventions will make a difference, but only within limits. Corporations have too much influence over governments to allow regulations to seriously affect profitability, though they may give away a few tenths of a percent if their public relations are bad enough to make it difficult for local politicians to keep up their support. But access to land is the most important thing for the mining industry, as mining companies need to be able to find and get to the ore, wherever it is. The rest is just problem-solving, whether in finance or engineering. That’s why the notion of ‘Free Prior Informed Consent for Indigenous Peoples’ — now enshrined in the UN Declaration on the Rights of Indigenous Peoples — has sent the industry into such a frenzy of obfuscation. People might say, “No, we don’t want a mine here, these are our forests, streams, lakes, farms, harvesting areas, and sacred places and we want to keep them intact.” And even if they did agree, they might demand the most stringent (and expensive) forms of environmental protection and socioeconomic guarantees, and even limit the size and speed of the mining. And this is why it has taken over a decade of sustained pressure from some of the world’s biggest conservation groups to push for ‘no-go zones’ where culturally and ecologically-sensitive areas are set aside as unsuitable for mining. Never to be mined. Ever. There should be no question that there are areas that should be protected from mining, such as the Ecuadorian páramos (high wetlands), the glaciers of the Andes, or sacred forests and mountains, whether in New Mexico, Greece, India, or in the Philippines. That protection should also be extended to conflict zones, where mining can only reinforce violence and repression, whether in Colombia, Eritrea or Congo. (The late Robert Goodland outlines the concept nicely in his 2012 monograph for the University of Vermont Institute for Environmental Diplomacy and Security (IEDS), ‘Responsible Mining: The Key to Profitable Resource Development’). While restricting the mining industry’s access to raw materials will narrow the profit base for mining companies and metal traders, it will result in better dividends on other levels. It will prevent violence against indigenous peoples and peasants, the destruction of local economies and of precious and irreplaceable waters, places, and ecosystems, as well as allow other forms of more sustainable development to take root. It will also result in fairer market prices for the metals we depend on — and waste. Fairer prices will reflect the real costs of the ecological and human sacrifices that go into making the materials available for our use. Community Consent and Scarce Commodities by Jamie Kneen is licensed under a Creative Commons Attribution-NonCommercial-NoDerivs 3.0 Netherlands License. Based on a work at The Broker. Jamie Kneen is Communications and Outreach Coordinator at MiningWatch Canada.